Photographer Tadas Kazakevicius tells Brandon Hoops the story behind one of his favorite pictures from Lithuania. 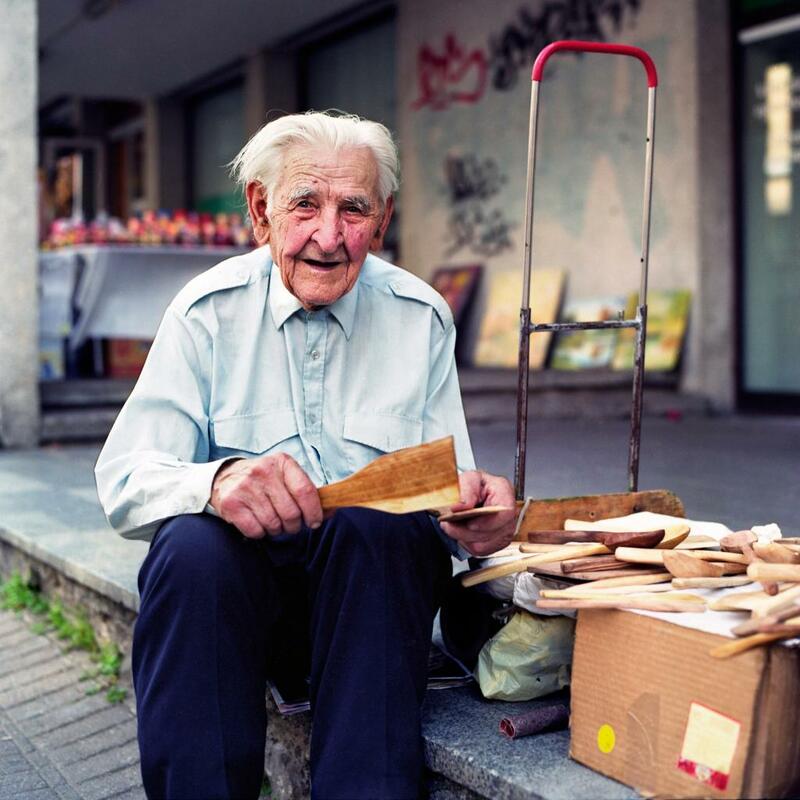 Part for his face, which carried the weight of years beyond imagine, and part for the wooden spoons piled on a box at his side, I introduced myself to the old man sitting on the curb of Pilies Street in the Lithuanian capital of Vilnius. He told me his name and then got a little ornery. “I am not old, I am just 90 years old,” Juozas said, his ragged cheeks framing a soft smile. I smiled back and sat down on beside him, glad that Juozas seemed at ease with my company on a leisurely summer morning. He told me he makes the spoons from the trees in his yard: “At first I had 30 trees but now just 12 are left.” He told me he finished his engineering studies in 1951 and then worked in Soviet countries supervising big developments. Before I knew it, 30 minutes had passed and Juozas was hardly paying attention to his clients. I wanted to let him get back to business, so I asked if I could take his portrait. Again, he was so cooperative. I took my shot, thanked him for his time and moved on. That day I passed Juozas couple of more times. Even in the late afternoon he was still sitting and selling his handcrafts. “I sold ten of them already!” he shouted when he saw me approaching from afar. I thanked him again and waved goodbye. Tadas Kazakevicius, 27, is a native of Lithuania. 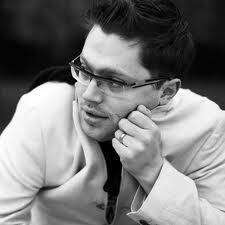 He who moved to London in 2007 and works as a graphic designer. Although the tourists and shoppers and couples that crowd Pilies Street on evenings and weekends were noticeably absent that day, I had come to interact with people like Juozas: the interesting, the classical, the unknown. The older generation of men like Juozas so easily slips from the grip of time. Since 2009, I’ve been pursuing a series of portraits, called “The Unknown,” in a manner akin to the work of an archeologist sifting through the dirt with a brush, only my tools are a medium format camera and a conversation, which I use to wipe away the dust and give life to small remnants of the histories and activities of the men I meet in the street. I find most of the men on my lunch break in Queen’s Park in London. Whereas most street photographers just snag a shot and then sneak off, I approach them ready to linger, ready to listen, ready to make there unknown lives a little more known. My camera is the entry point. Anytime I approach someone and ask to take their portrait, it feels like asking a girl for a dance. I’m all nerves and excitement. My heart moves faster than my feet. I don’t really remember things clearly. Soon I catch the rhythm, forget about rules, and start to feel natural. What amazes me every time is how readily people invite you into their stories. They love an available ear. They want to tell you things: their time at war, their time in love, their time at work. They have so much to tell. Sometimes I don’t even have to ask questions. They just run on like a river, and I get swept up in the current. I don’t carry a notepad. I don’t like being so formal. I keep everything in my head and try to put down on paper what I can remember. If I don’t remember something, it probably wasn’t important. My hope in pairing my portraits with these mini-biographies is to document real lives in as personal and natural way as possible. I’m really scared of young people. They feel like they have so much to prove, so many to impress. But old people, like children, don’t care. They do not act. They do not rush. They put you at ease because they approach life with sincerity and freedom. When I started photography, I was a lot like these image-conscious teenagers, I tried everything to fit in and be a perfect photographer. But when I started this project of unknown portraits, photography started to make sense to me. I cast aside pointless worries and questions and let my enthusiasm take over. You have to be in love with the photos you take. It makes me happy to say that I am.